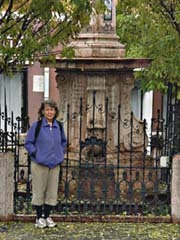 Louisa Rogers in her Old Town Eureka home. Photo by Katie O'Neill. Inset of Rogers on a swing in her backyard in Budapest, 1957, and the Hungarian Parliament buildings today. TO A 5-YEAR-OLD PEEKING OUT THE WINDOWS of the U.S. Embassy, the tanks looked terrifying as they rumbled down cobblestone streets. Gunfire echoed off bullet-torn buildings; rubble lay in piles on the ground. The 5-year-old was myself, the place Budapest, the year 1956. Forty-seven years later, on a crisp November morning, I stood on a grassy square in front of the Hungarian Parliament buildings, where one of the first attempts by a small satellite nation to free itself from Soviet rule took place. 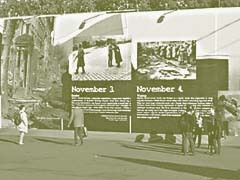 Huge black-and-white photographs depicting the fighting of '56 were mounted on display. The sun shone brightly; the Danube was just visible past the Parliament buildings. It was hard to believe this lovely spot had been the location of such violence. I was back in Budapest to pursue a dream: to apply the business skills I teach at home to this post-Communist society. 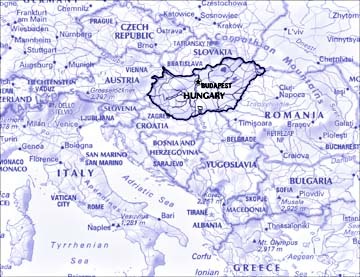 Thirteen years after gaining independence from the USSR, Hungary is poised to join the European Union in 2004. My long-term goal was to train Hungarian businesspeople in management skills and customer service. This week, I hoped to make contacts and scope out possibilities. My father, an American diplomat, was assigned to Budapest for four years in the `50s. We lived there during turbulent times before, during and after the Hungarian Revolution. It was an experience that had a deep emotional impact on my parents and my family, and ever since I have felt a connection with Hungary. 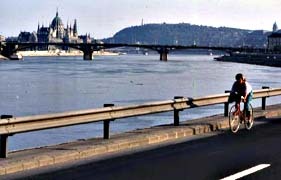 It was not my first time back; in the summer of 1986 my husband and I bicycled across Europe and stayed in Budapest with my former kindergarten teacher, a family friend. Before leaving Eureka for my latest trip, I surfed the Web and found the sites for the American, Canadian and British chambers of commerce; two English-language newspapers in Budapest; and several business organizations. I e-mailed the contacts, introducing myself, and heard back from a few of them not as many as I had hoped. I was going to have to invest more sweat equity than a simple e-mail to impress them. My old friend Bill, with whom I would stay, picked me up at the airport. He is the site security manager at the U.S. Embassy. In the taxi, he explained how, since 9/11, the U.S. government has been "dumping concrete" all over its embassies. Indeed, when he showed me the building, it looked like a fortress surrounded by a moat of concrete. Construction consumed the entire block and apparently annoyed the neighbors. Hungarians who want a visa to the United States have to wait under open skies across the street until they hear their name bellowed through a PA system. Then they navigate a succession of outer checkpoints before entering the building. Inside, Bill waited while I showed the Marine on duty my passport. I peered around, remembering fleeting images from the week I had lived in this building as a child. The families of U.S. diplomats decamped to the embassy for several days during the first stage of fighting. To the 30-odd kids, it was a party. We got to sleep on mattresses in our daddies' offices, eat in the cafeteria and have a Halloween party. It was no picnic for the adults, however. There was only one hot plate to cook on. And a week later, when the fighting intensified, we were evacuated to Vienna. In the middle of a snowstorm, visibility near zero, my father led a convoy to the border where we were stopped by the Russian military and forbidden to cross. (My father only turned around after a Russian soldier pointed a rifle at him.) Local townspeople put us up in a schoolhouse, where we children acted out the events we had witnessed that day; one boy played the role of border guard while the rest of us lined up to cross. The story of a group of American kids playing a pretend game while in the midst of fleeing Hungary made headlines in the United States. The next day, the Russians allowed us to leave the country. Today, the threat of communism seems a distant ghost, and many might look back on it as absurdly exaggerated. But it was very real the two superpowers, after all, came to the brink of a nuclear exchange during the Cuban Missile Crisis in 1962. In Hungary in the mid-'50s, the Red Army was literally just over the horizon; so when the October 1956 uprising broke out, the hard fact of the matter was that no Western country, not even the United States, was in a position to rush in and help. For a few days, amazingly, it looked like the revolution would triumph. Then the Soviet tanks came, crushed the uprising and installed a puppet regime. "The Hungarian Revolution seized the world's awareness as no other event of that period did," my father told me once. "Thousands of Hungarians left and were taken in by Europeans and by the U.S."
I am Elinor Rogers, 8. My father is a diplomat and we live in Budapest, Hungary, Europe. On Oct. 31 a band of Hungarians gathered in front of the embassy and began crying something. Daddy said we couldn't help because our army was in America. Europe is our fellow country and you should help her if she is in danger. Even if you came halfway across the country and then lost, you would at least have glory. I wish America wasn't so rich. I wish I could give some of America's richness to Europe, so they would be even. Europe will never be friends with America, if you don't help now. Please do. If you don't, I'll never like you again. On Sunday, the day after I arrived, Bill and I visited his friend Katalin on the other side of the Danube. 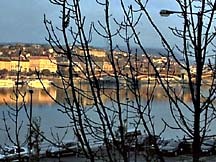 Budapest is built around a river; Buda is the hilly, mostly residential side; Pest is the commercial center. The city looks and feels like a quieter, gentler Paris. "Europe's best-kept secret," I read in a tourist brochure. 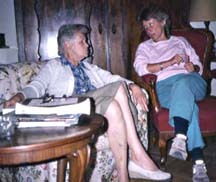 When we arrived at her home, I was relieved that I had changed out of my Humboldt casuals and dressed up, at least minimally; like most Europeans, Katalin dressed elegantly even in casual moments. A bilingual woman with an adult son living in New York, she owned a business leading cultural and historical tours for Americans and other English speakers in Budapest. She poured me Hungarian wi ne in a long-stemmed glass and we sat in her living room, discussing possible contacts. Bill had told me she had money worries, but I would never have guessed. Her clothes and furniture looked much more upscale than mine. But I remembered from family stories that Hungarians have a great deal of pride. The next morning, at the Budapest Breakfast Networking Organization, 12 of us met in the private room of a restaurant, eating eggs and toast and Hungarian sausage. The director, Paul, was a former executive from Manchester, England, who had launched two networking groups in Budapest: this one in English, another in Hungarian. One by one, we introduced ourselves. Our group consisted of the director of an executive search firm, the owner of a mystery shopper service, an attorney/mediator, several marketing consultants, a magazine photographer, an owner of an espresso cafe, and an owner of a chocolate and candy shop. Besides the Hungarian members, there were several Brits, one American and an Italian in the group. This week it was Brendan's turn to give a 10-minute presentation on his marketing business. After his talk, the discussion veered into customer service, which is lacking in Hungary. "I would market customer service in the context of cultural change if I were you," said Brendan, a Briton. "How do you encourage change in a people who have been told what to do for more than 50 years, and robbed of any initiative? There's a need for customer service, but the bigger issue is cultural change." "How to bring about change without losing control," Paul said. "Many managers are afraid of being exposed as unknowledgeable. Their autocratic management style covers up this fear. There's a Hungarian saying: `God made the earth in six days and rested on the seventh. On the eighth day along came a Hungarian who corrected God's mistakes.'" Peter, director of the executive search firm, came up to me and suggested we refer clients to each other. I didn't want to discourage possible business, but a reality check seemed only fair. I told him I was willing, but it was unlikely to happen often. It's not as though I regularly run into people in Humboldt County who are relocating to Hungary. Nadas, the attorney, offered to help with contracts if I set up trainings in Hungary. I had been advised to be very careful with contracts. Along with poor customer service, there were widespread problems with business ethics. I remembered what Ernie Nagy, my father's friend and Embassy colleague, had said about the revolution: "What set it apart from all others was its near perfect purity: no looting and almost total unanimity of purpose." It sounded, sadly, like times had changed. Every day, an early morning constitutional. Bill and I would leave the apartment, head over to the Margit Bridge, then walk the length of Margit Island, which lies between the two halves of the city. We'd walk along the gravel-jogging path, past the thermal baths, watching the sunrise through the linden trees. And every day, a meeting. On Tuesday I had lunch at the Iguana, an American-owned Mexican restaurant, with Shar, the president of NAWA, the North American Women's Association, whom I had found on the Internet before arriving. Shar brought along Sue, a Canadian from Ottawa married to a "'56er," the phrase for Hungarians who lived through the revolution. I explained my goal: to offer trainings in Budapest, returning two or three times a year, not relocating. Sue took a generous bite of burrito. "I just don't get it," she said. "I don't see how you can make it work from a distance." "How will you do follow-up?" Shar asked. "Hungary isn't like the States or Canada, where the concept of customer service is wired into us. I don't think you can offer customer service in two or three hours and expect it to stick." The problem does indeed run deep. During my 1986 visit, I was sitting at a Budapest cafe with a friend and waved at the waiter, trying to get his attention. My companion laughed at me, explaining that, if anything, my gesture would put the waiter off. Since communism tried to eliminate the profit motive, the concept of service, that the customer comes first and should be attended to, was alien. There was simply no economic incentive to do so. Clearly, that is is still a problem today. All week I heard a litany of the terrible quality of customer service. Even multinational corporations with record sales had trouble maintaining high customer service in Hungary. Consulting firms offered customer-service trainings, but they didn't seem to have a lasting effect. I wondered how I could use this problem to my business advantage. That evening, Zsuzsa, Bill's Hungarian language tutor, dropped by. Yet another well-dressed woman, she was decked out in a wool suit, neck scarf, costume jewelry and high heels. We sat on the couch talking away like old friends. She told me she'd love to move to the United States but didn't have connections. 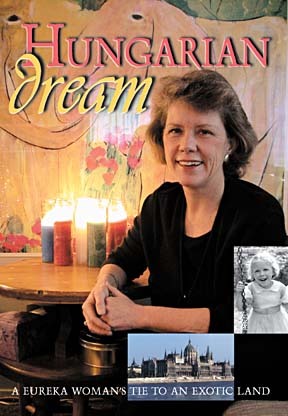 Several of her family members had health problems, and she couldn't abandon her aging mother. I could picture her in the States: one of those indefatigable immigrants, willing to work hard, thrilled by the structural and psychological freedoms the United States offers. "Do you speak any Hungarian?" Zsuzsa asked. "Igen," I said, meaning "yes." Then I broke into English: "I remember four words: `yes,' `no,' and `watch out.'" "When you come back, I will give you a lesson." Like many middle-aged Hungarian women, Zsuzsa was divorced. She talked openly about her ex-husband's infidelity, which is common in Hungary. She blamed it on communism. Women were forced to go to work too early, in her opinion, before they were ready. They worked for totalitarian bosses who exacted sexual favors. Home didn't offer much of a positive alternative alcoholism and domestic violence were also common. Hungary has the highest rate of alcoholism in Central Europe, and until 10 years ago, the highest suicide rate in the world. Although it has declined, it is still high. Anton and I left the embassy as dusk was falling, to be home before dark, and drove slowly down Bajcsy-Zsilinszki ut (street), which was bristling with tanks. We were the only civilian traffic. At the bridge, the Russian and Hungarian army patrols checked our papers and permitted us, as diplomats, to pass. Then we eased between two tanks. I suppose it is easy to describe the face of the enemy they seem usually to be called `glowering' or `threatening' and it is true these soldiers certainly did not give any impression of camaraderie. But who can describe another's inner feelings at such a time? Some Russians defected during the revolution. Perhaps our `threatening Mongol' was one. Did he think he was standing on a Nile bridge, or in Berlin, instead of over the Danube? And the Hungarian soldier what did he do the day before and the day after? How did he come to find himself patrolling side by side with the hated enemy that his countrymen, with a unity unknown in their entire history, had just risen against? On the other hand, I suppose one has to give his momentary impressions of the enemy, subjective though these be. I never saw a pro-Soviet force during the revolution man or tank which struck me as anything but hostile and threatening. My father's reference to the Nile was no accident. On an earlier trip to Budapest, my former kindergarten teacher described her run-in one night during the revolution with a Russian soldier who asked her for a cigarette. As she gave him one, he gestured toward the river and asked, "Suez?" Russian conscripts had been told they were going to Egypt. Why? Because at the very same time Hungarians were rising up, Israeli brigades, backed by the English and the French, invaded the Suez Canal. The goal was to thwart Egyptian president Gamal Abdel Nasser's attempt to nationalize the strategically vital transportation corridor, but it backfired after the Soviet Union threatened to intervene and after President Eisenhower condemned the attack. Later, I hopped on the tram to cross the river. The Soviets invested heavily in public transportation, leaving Budapest with a fine tram and subway system whose tentacles spread far. This afternoon I was meeting Willy Benko, the managing director of Euronet, a company that makes cash-dispensing machines in Europe, and the man known as "Hungary's motivational speaker." I was pleased he was willing to meet me. In fact, everyone seemed willing to meet me. Why? All right, I was American, but "Eureka" is not exactly on the map. Perhaps the fact that I was there for only a week? But if I were to arrive in, say, Atlanta, and announce, "I'm here for a week," I couldn't imagine people necessarily opening doors. We sat in the company conference room, drinking coffee in china cups, with delicate ginger cookies presented on a silver tray. Willy turned out to be another bilingual, had lived in Texas and knew Dr. Phil. He was the speaker every month at the "Budapest Power Lunch." He had also launched Hungary's only Toastmasters club. "What's your main topic at the power lunch?" I asked. "Personal responsibility. You can't talk enough about that here. In Hungary, failure is not an option. If mistakes happen, they are always someone else's fault." "I've worked with a lot of companies in the states where the same thing is true," I said. "Yeah, but it's a matter of degree. If Hungary is going to succeed in the European Union, we have to overcome the old mind-set. We've had 13 years of independence, but we have a long way to go." During the week, I decided to attend the "Big Smoke Executive Cigar Club Networking Event," held at a local bar, sponsored by the Budapest Business Journal and the Hungary Tobacco Institute. Evidently Hungary hadn't joined the anti-smoking bandwagon yet. I wasn't thrilled by the thought of an evening of cigars, but I dropped by the business journal's office to sign up anything for the cause. The young male clerk at the desk shook his head, saying, "I'm sorry, but this event is for executives only." "I am the executive of my company," I said, filling every inch of my 5'1" frame. "Oh, I'm sorry," he said, and signed me up. At the bar, I arrived early, and forced myself to go up to a man who turned out to be from neighboring Slovakia. Networking is always a bit awkward in the beginning, but it was easier in Hungary. From that moment on, the conversations didn't stop. I met business owners, high-level managers, and journalists, mostly men, a few women. By the end of the evening my clothes had a smoky flavor, but didn't reek. I didn't sample a cigar. Few people did. My networking produced some tangible results: The Budapest Business Journal, published by a guy from Philadelphia, will run my business column; I've been invited to be a guest speaker at the power lunch; and the Central European University, which acts as a broker to companies requesting trainings, will recommend me when they have a request for an English-speaking trainer. It's a start. I would love to fulfill my dream, and be invited back two or three times a year all expenses paid, of course. But whether that transpires or not, my week in Budapest was worth every moment. Nothing stirs my sense of vitality more than taking action on a dream. I can't really understand or empathize with the depth of change asked of Hungarians in this time; I've never had to face the kind of changes they face. But I respect the challenges in front of them, and if I can be a part of their new revolution, I would consider it a privilege. Louisa Rogers is a Eureka-based business trainer and coach who specializes in customer service, management skills and communication in the workplace.